Our Football Challenge Game is an exciting inflatable game that lets players young and old show off their passing game. Future quarterbacks can face off with each other, as they throw the football across the field to the back wall that holds a line of receivers. Once the pass is completed, the football then is returned to the opposing quarterback's lane. The competitive spirit of this inflatable game really gets going as each player tries to get rid of all of their footballs to win the game. 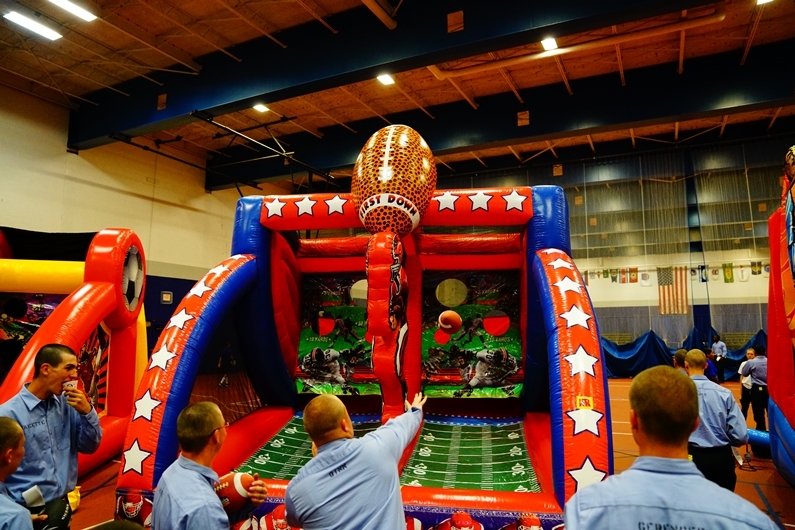 The Football Challenge inflatable game is a great way to promote exercise, healthy competition and sportsmanship, and is a fun addition to any birthday party or event for guests of any age. This inflatable football game will attract future football stars to any party or event! L 16'0"x W 14'0" x H 16'8"
Each Player must not have any pre-existing injuries or be pregnant.We are not a drop and run service. A trained member of our staff will run the inflatable football challenge game or you can have a chaperone to ensure the safety of your guests. A G-Force Represent will always on site for any questions. All our equipment is inspected by our staff before your event for safety. G-Force Laser Tag We Travel to You Anywhere On Our Planet For a Football Challenge Event.